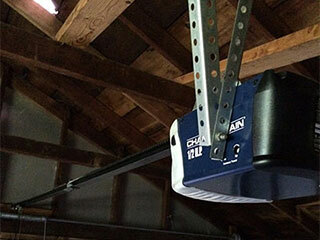 Any machine as complex as a garage door opener is bound to develop troublesome issues sooner or later. When you consider that the average garage door opens and closes 1500 times every year, it's really no surprise. When your system malfunctions, our skilled technicians can be there to quickly get it back in perfect working order. We can repair models made by all the major brands, including Genie, Liftmaster, Craftsman and many more. We stand and fall on the quality of our services and the capabilities of our professional technicians. If your garage door opener is having trouble receiving a signal from the remote, there could be something interfering with the frequency of its receiver, or something might be wrong with the circuit board. Either way, our highly trained and skilled technicians can identify the issue and provide a fast and cost-effective solution for it. If your opener is past repair, we can replace it with a brand new unit from some of the top brands. We have a wide range of residential models for you to choose from, and we'll make sure you take everything from the type of drive system (belt, chain or screw) to special additional features (smartphone compatibility, backup battery system, etc) into consideration. Once you've found the right model for your specific needs, we'll proceed with the opener installation process and make sure that you know exactly how to use the unit safely. Regular maintenance checks are highly recommended if you want your opener to perform at its best for many years to come. Our friendly and professional technicians can spot any potential problems and nip them quickly in the bud. We'll inspect the motor gear and the circuit board to make sure they aren't damaged or worn, and we'll also test the safety sensors to make sure they're capable of properly detecting an obstacle. If you need advice on choosing a new opener, or you'd like us to check and repair the unit you currently have, call Garage Door Repair Alpine today. Our experts are waiting to assist you with whatever you need.